NOTE : This post is an update of my podcast and post from about a year ago describing how I use a fictional break up letter to help teach the purpose of the Declaration of Independence. In the original podcast, from September 2007, I included audio of my class while doing this activity. Today - October 30, 2008 - I did this activity with my 8th graders and instead of capturing their reaction using audio, I used my Flip video camera and took video of the activity while it was happening. It was great and really shows how the activity works in a real classroom. I have embedded the video with this post. Hello. Today's podcast describes one of the activities I use in class to teach about the Declaration of Independence. Students often don't really understand the purpose of the document and this activity usually helps. I act as if I have found a note on the floor of my class the day before after school and then I read it to the class. It is a break up letter and at the end the students are stunned to learn that it is from "the American Colonies". I have included the text of the letter that I use below and the podcast has a recording of what happens when I read the letter in class and the discussion that follows. The podcast also has some hints and suggestions if you would like to replicate this activity in your classroom. I'm sure someone out there does something similar but I have not been able to find it anywhere else. I really enjoy this activity and my students have fun with it as well. I'm not sure how to start this letter but I feel we need to talk. I've been thinking about us a lot lately. Things used to be so great - it was like we were M.F.E.O. I mean everyone said it was perfect. I really thought we would be together forever but then things changed. I feel like you started to take me for granted. You just started to do whatever you wanted and never even asked me about anything or how I felt. I've been thinking about this for a while and I don't want to hurt you but I think it is time we broke up. I mean it's just not going to work. I need some time by myself to see what it is like on my own. I'm sorry things didn't work out but I do think YOU are the one to blame. Sorry but "US" is over. Hello. A week from tonight we will elect a new president and many teachers across the nation are implementing online resources to explain the process to their students. 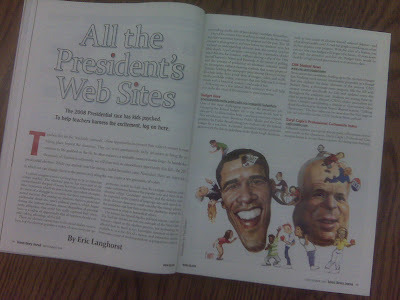 I recently wrote an article which was published in School Library Journal magazine (September 2008 issue) describing a variety of resources. The article is available in print or you can view the entire article online here. In today's podcast I discuss the resources listed below. If you use an additional online resource to teach the election please share it by adding a comment to this blog post. Hello. After I presented my preconference session on Monday afternoon I decided to visit the Space Needle. Everyone in Seattle has to visit the Space Needle right? I took the Monorail over to the Space Needle and as I paid $16 for my ticket to ride the elevator to the top I had doubts that it would be worth it but I must say that I was not disappointed. I arrived at the top of the Space Needle at about 5:30 PM right as the sun was setting over Elliott Bay. The sky turned several shades of red as ships moved in the bay. The city came alive as it grew darker and the lights began to show a city alive. I spent about an hour at the top and even watched part of a football game below - as I watched one team even scored a touchdown. I have included some pictures from my visit and also took along my trusty Flip cam to record some video. I made a video Monday night and have posted it so my students can share in my visit to the Space Needle. If you have any comments or would like to share your experience in visiting the Space Needle please leave a comment to this post. Thanks. Hello from Seattle. I'm in Seattle to present at the 2008 T+L Conference. My presentation is Monday afternoon but I did get into town on Sunday afternoon. After checking in to my hotel, I walked down to my favorite Seattle location - The Pike Place Market. I took some pictures and video with my Flip. I created this short video on Sunday night so that my students back in Liberty, Missouri could watch it in class. It has some video of the original Starbucks, buskers and the "wall of gum". Hello. A couple of weeks ago while attending a national teacher of the year workshop in New York City I was able to visit a location that I knew I needed to visit at some point in my life - Ellis Island. My grandfather, Henry C Langhorst, immigrated to America in 1924 as a 26 year old German who knew no English and came through Ellis Island. I spent about 5 hours soaking in the history at Ellis Island on September 30th and recall the experience in my podcast. It was an emotional experience for me and I was moved to tears on several occasions that day. I have also included some pictures and a video from my Flip video recorder.